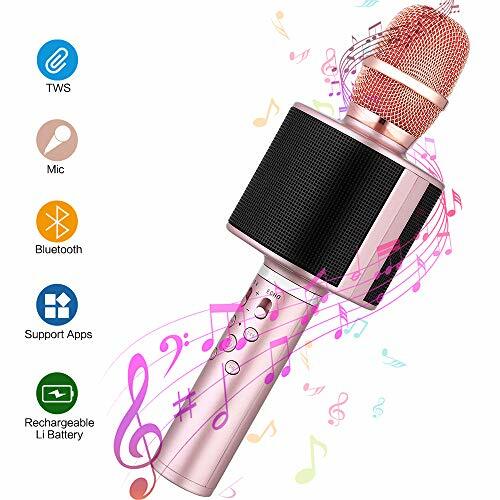 【 High-Quality Noise Reduction & Bluetooth TWS 】The Wireless Karaoke Microphone has superior metal filter head, three-layer high-density noise reduction, expertly reduces noise and dust interference. Pairing two microphones with one phone through Bluetooth TWS. Two singers can sing together, totally KTV Pro. 【 Remarkable Sound Quality 】The Bluetooth Microphone built-in 50mm big stereo speaker, professional tuning system, adjustable echo length effect can bring 360 degrees super surround with immersive enjoy. High-quality super big dual speakers for Living broadcast, KTV, Party, Family, Travel singing; Car Stereo, Instrument Recording, Interviews, speech etc. 【 Two Ways Connection 】Bluetooth Connection & Cable Connection. You just need to connect your phone with cable or Bluetooth, and then open the singing APP on your phone. 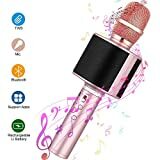 The Karaoke Microphone built-in clearly audio and vividly sound effect can make you enjoy listening and singing anytime and anywhere. Great for KTV singing, gathering singing, family singing, travel singing, car stereo, instrument recording, interviews and live etc. 【 Wireless Recording Songs 】After pairing the phone with The Karaoke Microphone, you will be able to record songs through our microphone on many karaoke App, like "smule". And you can long press the microphone play/pause button to directly remove the human voice. No need to download accompany. Pull out the bottom phone holder and fix the phone on the microphone for easy viewing of the lyrics. 【 More User-friendly Features 】Open the camera of the mobile phone and press the " Power on/off" button of The Bluetooth Microphone to take photographs or videos when the Bluetooth connecting. The Bluetooth has a great distance of connection(33ft). High Compatibility-Supporting TF card max 32GB. Supports Android, iPhone, iPad, IOS and all Smartphone.